Once again Americans woke up this morning to read in the news today that airbag safety is still a major problem in this country. Auto accidents in the Tampa Bay area continue to plague motorists even though advances in safety and design have made significant progress over the years. Yet, defective airbags are still causing devastating injuries, deaths even, despite years of scrutiny, lawsuits, and criminal charges. The Matassini Law Firm, P.A. has been investigating defective airbags for several years. Ten years after the biggest safety recall in U.S. history began, Honda says there are more than 60,000 vehicles on the nation’s roads equipped with what experts have called a “ticking time bomb” — defective air bags like the one that killed Brangman. The air bags, which sit about a foot from a driver’s chest, have a 50-50 chance of exploding in a fender bender. They are the most deadly air bags remaining in the recall involving more than 37 million vehicles built by 19 automakers. At least 22 people worldwide have been killed and hundreds more permanently disfigured when the air bags that deployed to protect them instead exploded and sprayed shrapnel. The worst among the bad bags are known as Alphas, driver-side air bags installed in Hondas that have up to a 50 percent chance they will explode on impact. The 62,307 people still driving with them, many in older-model cars that may have changed hands several times, either have ignored the recall warnings or never received them, Honda said. With the number of deaths and disfigurements continuing to climb — the last fatality was in January — automakers and federal regulators have rewritten the rule book in their outreach efforts, including deploying teams to knock on doors of Honda owners who have not responded to recall notices. The massive recall of air bag inflaters made by Takata — which allegedly suppressed tests revealing the flaw and where three key executives are under federal indictment — is well known to Congress and millions of Americans who have been touched by it. But tens of thousands of drivers most at risk remain oblivious to the efforts of automakers and the National Highway Traffic Safety Administration. NHTSA has been without an administrator in the 15 months since Donald Trump entered the White House. The president recently proposed elevating acting director Heidi King to lead the agency. King, whose nomination will require Senate confirmation, told the Commerce Committee last month that car companies have “made progress” on the Takata recall. Takata air-bag inflaters degrade over time as they are exposed to humidity and repeated wide fluctuation in the daily temperature. That a car may change hands three or four times during a 10-year period has made the recall more difficult, with notices from the car dealer or automaker discarded by people who sold the vehicle years earlier. While most Takata inflaters go bad over time when exposed to temperature changes and humidity, the Alpha inflaters experienced high humidity at a Takata factory in Monclova, Mexico, before they were installed. The Alpha bags were installed in more than 1 million Honda and Acura cars between 2001 and 2003. They caused 11 of the 15 U.S. fatalities when their Takata inflaters ruptured. Although there had been inklings that Takata air bags could be deadly — with fatal explosions in 2003 and 2004 — the first U.S. recall was initiated by Honda in 2008. The 10 years that followed have been replete with allegations that Takata cut corners in a rush to fill orders and that the company sought to cover up tests that revealed the severity of the problem. The genesis of the massive recall came when Takata, then a seat-belt supplier but a minor player in the air-bag industry, came up with a cost-cutting way to make air bags. Just a few years after the 1995 Oklahoma City bombing, they used the same material that caused that explosion — ammonium nitrate — to trigger the air-bag inflaters when vehicles collide. Ammonium nitrate — unlike the relatively stable chemical tetrazole used by other manufacturers — can become unstable, particularly when it is exposed to moisture. Takata found a ready market for its cheaper air bags, expanding rapidly to meet the demand of newly enticed automakers, including General Motors.GM’s air-bag supplier had been the Swedish company Autoliv, but Autoliv dropped out of the competition presented by Takata because it declined to use the volatile ammonium nitrate. Autoliv’s decision to abandon the GM contract was first reported by the New York Times, as was the scenario that ultimately led to the charges filled against three Takata executives. 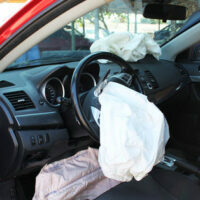 After a 2002 Honda Accord air bag exploded in Alabama in 2004, Takata assured Honda that the incident was an anomaly. But at the same time Takata began testing 50 air-bag inflaters it had collected from junkyards. Even though two of them malfunctioned, Takata shut down the testing and told technicians to wipe the data from their computers, the New York Times reported. The company denied to Congress that it had ever done the testing. Years later, NHTSA said Takata was not “being forthcoming with information” or cooperating with the “investigation of a potentially serious safety defect.” The Justice Department in Washington D.C. fined Takata $1 billion for that failure. McQuade also unsealed indictments against three Takata executives who were charged with manipulating test data to deceive the automakers they supplied about the safety of their air bags. The indictment said the three had known as early as 2000 that their air bags could explode. All three of the men indicted — Shinichi Tanaka, 59; Hideo Nakajima, 65; and Tsuneo Chikaraishi, 61 — are Japanese citizens and have not been extradited to the United States. Faced with spiraling debts estimated at more than $9 billion as a result of the air-bag scandal, Takata declared bankruptcy last year. Contact Tampa Bay personal injury lawyer Nicholas G. Matassini with The Matassini Law Firm, P.A. for a free confidential consultation if you or a loved one has been injured in a car crash. We have successfully obtained financial compensation for Florida motorists since 1976. Let our family help yours. Visit our website at www.matassinilaw.com .